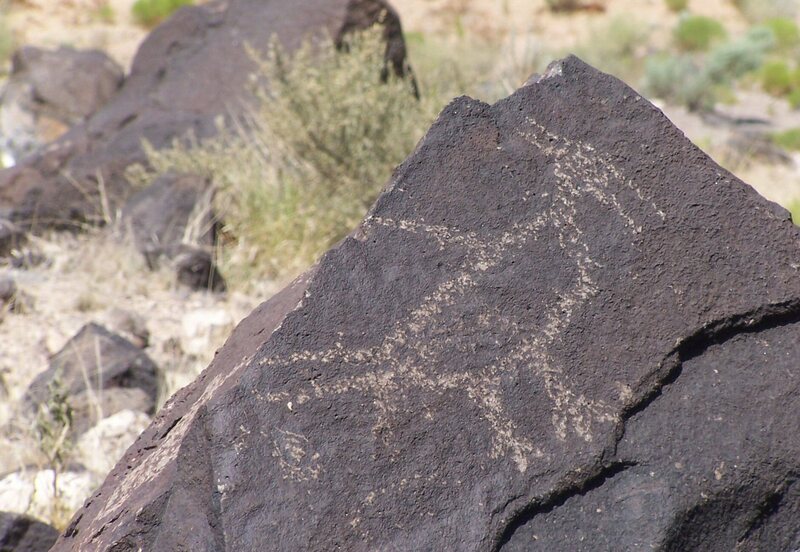 Petroglyph National Monument was established to protect a variety of natural and cultural resources, including archeological sites, volcanos, and about 20,000 carved images. Many of these images can be recognized as natural features such as animals, people, crosses and brands, but many of them are more complex and are not completely understood. It has become clear that these images cannot be separated from the landscape around them, and were created by people to enhance their culture and their beliefs. 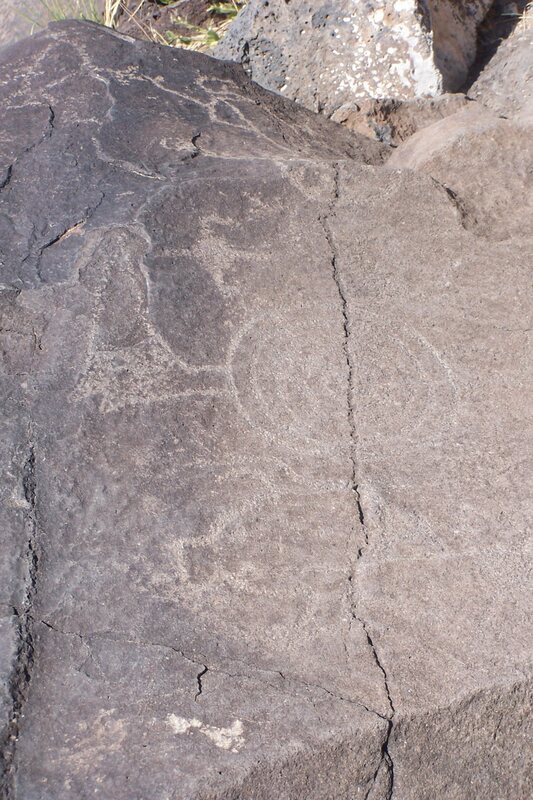 Those who created the petroglyphs include ancestral Puebloans, Hispanic sheepherders, and early settlers. 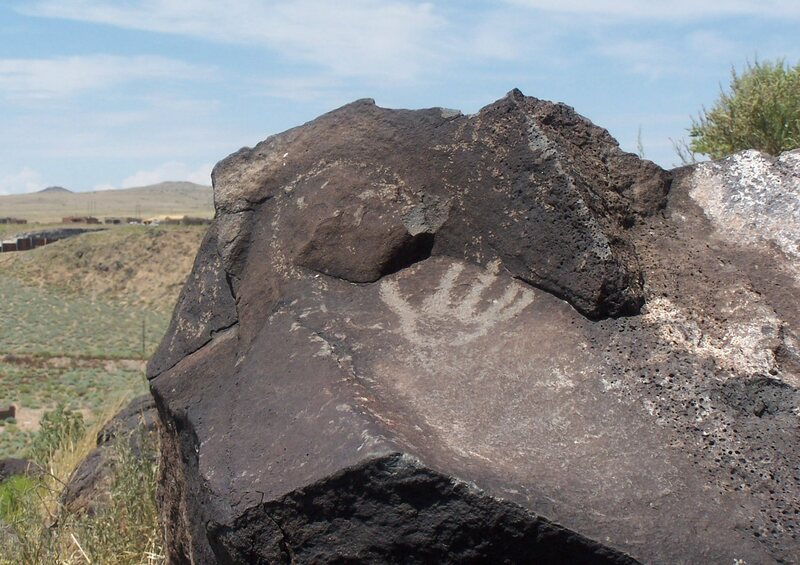 Petroglyph was created in 1990 through a cooperative effort between the National Park Service and the City of Albuquerque Open Space Division. The City originally set aside land in 1973 to protect what is now the Boca Negra unit, and called it Indian Petroglyph State Park. 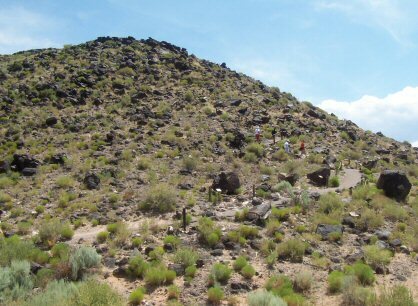 Although it contains but a fraction of the petroglyphs in the national monument, it's the most heavily visited part of the park, as it's the area closest to the City and most easily accessible as well. Apparently, lots of black volcanic rock. Lots of black rock, with some scrub bushes growing between. Beautiful this ain't, but that's not why we come here. We come here for the prehistoric drawings, or rather peckings, left on these rocks by the natives who lived here hundreds of years ago. 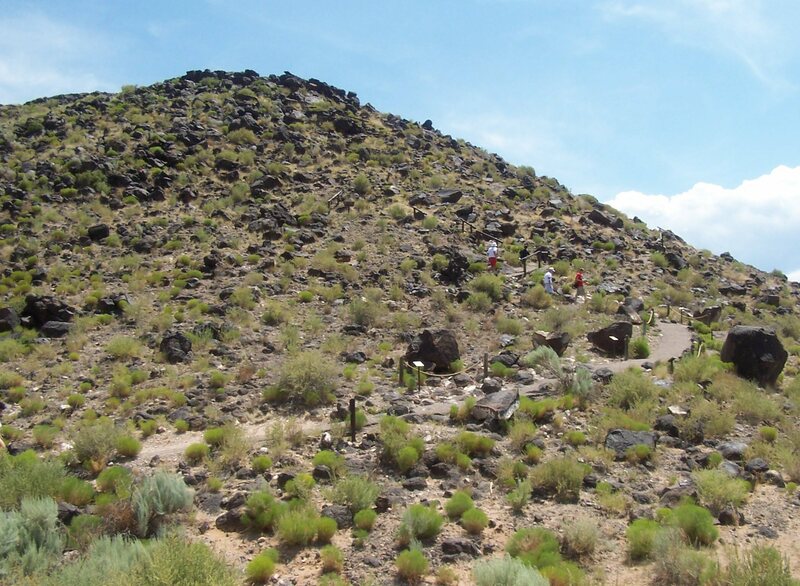 There are many trails you can take, of varying length and difficulty; all will show you petroglyphs left on the rock. 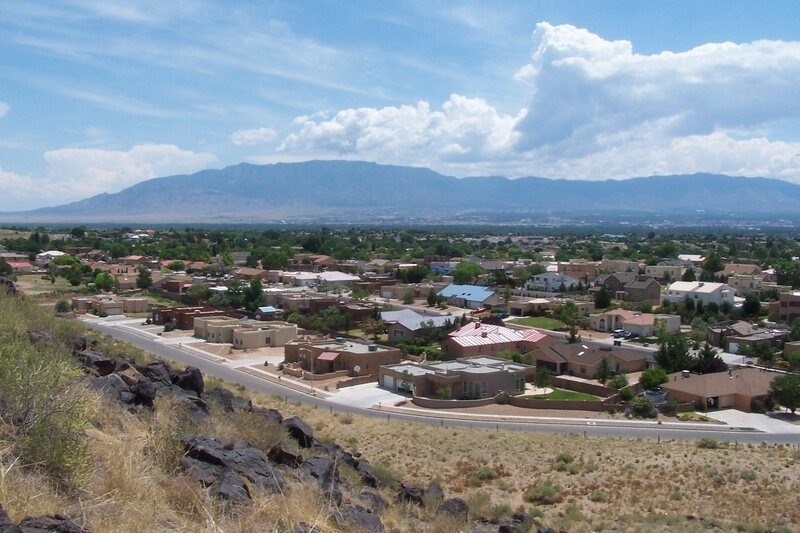 Some of the trails overlook the valley in which lies Albuquerque, which is an interesting view. Las Imagenes Visitors Center has some history of its own. It was originally the home of Dr. Sophie Aberle, knowwn as "Measuring Lady" by the Native Americans she worked with. She was an early practicing applied anthropologist in the U.S., and her focus was on women's lives at the pueblos. She was concerned with their health, diet, child care, and healing. She implemented practices which led to better conditions at the pueblos. 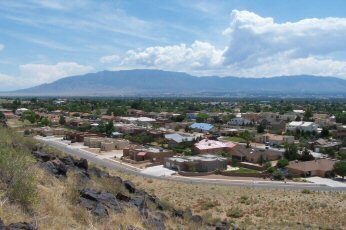 She and her husband, William Brophy, bought a house on what is now known as Albuquerque's West Mesa around 1955. They extensively remodeled it during the next 35 years to better suit their work. In 1990, she agreed to sell it to the Department of the Interior, as part of the establishment of this Monument. It was a beautiful day in Albuquerque when I dragged my family to Petroglyph. I had a sneaky feeling that this site wouldn't really thrill them, so we first went to the Visitors Center where a special presentation was under way. 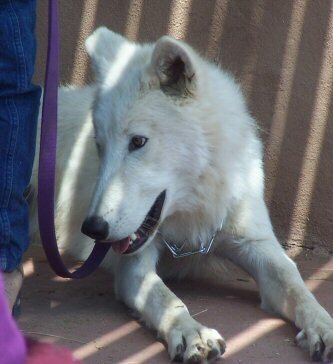 Apparently, the Wild Spirit Wolf Sanctuary is nearby, and on the day we went a docent brought a live wolf to the Center. The wolf was very quiet and well-behaved while we watched; the kids who wanted to, and who were brave enough (Luke! ), actually got close enough to pet him while the docent lectured us on wolf pack behavior and the difference between dogs, wolves, and coyotes. All in all it was a worthwhile visit to the Center, we thought, except for my wife. She doesn't care much for dogs, much less wolves. Thanks, Tinker. So, after we bought a stuffed animal toy or two, we were on our way to an exciting day of petroglyph-discovering! Well, okay, some of us were more excited than the others. 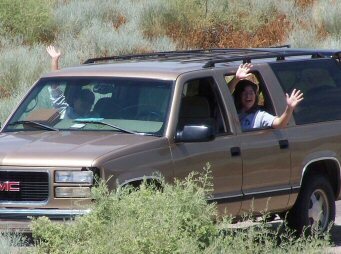 By the time we'd parked and paid our $1 parking fee, it had gotten pretty warm, and some of the family were quite content to rest in the Suburban while the rest of us jaunty explorers went on our way. Mike and Luke accompanied me up the first trail in Boca Negra Canyon. There was shade at the parking lot at the bottom of the hill, along with a bathroom, so it wasn't completely uncivilized. But it was warm, it was a dry desert climate, the sun beat down upon us, and the petroglyphs were ... well, they looked like someone had pecked various symbols and diagrams and personages onto roughly flat surfaces of volcanic rock. Impressed, we were not. What added insult to injury is that I had difficulty photographing the petroglyphs. I'm no photogapher, and trying to get dark brown images on black shiny rock to show up in hard sunshine was beyond my capabilities. What surprised me, and it wouldn't be the first time on this particular trip, was the number of people who were doing just what we were doing. How could this be? I'd never cared to see any National Parks before a chance encounter with a Passport in a visitors center; surely these people climbing the trail with me couldn't have fallen in love with Parks this way. Why were they out here? But out there they were, wandering the path, examining a petroglyph of a star, or maybe a sun, or a human, or a deer, or some figure that defied description. I've never met another person who is as interested in National Parks as I am. Logic tells me that of course, they're out there. But when I find visitors wandering over a rock heap of pecked designs, I still shake my head in wonder. In Albuquerque, take I-40 west to exit 154. Go north on Unser Boulevard for a little more than three miles, to Western Trail. 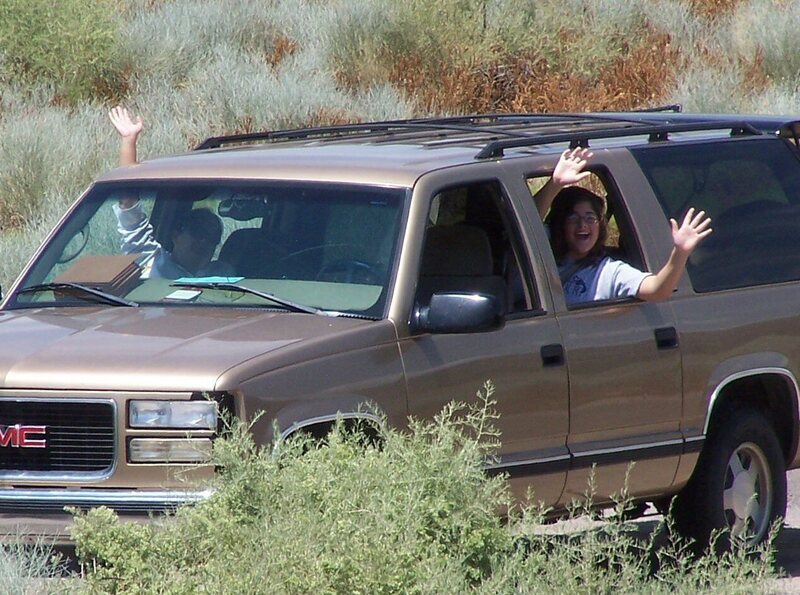 Turn west and you'll immediately enter Monument land, and the Visitor Center is a short drive along the road. About 50 miles north northeast is Bandelier National Monument. 60 miles to the northeast is Pecos National Historical Park. 100 miles to the east northeast is Ft. Union National Memorial. 50 miles to the south southeast is Salinas Pueblo Missions National Monument. 70 miles to the west is El Malpais National Monument, and 30 miles more lies El Morro National Monument. 100 miles to the northwest is Chaco Canyon National Historic Park.